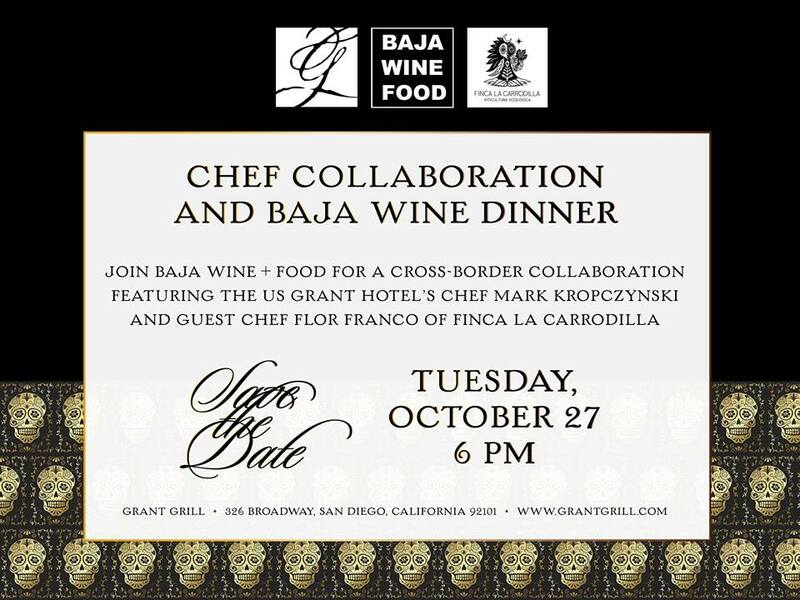 On October 27, starting at 6pm, The Grant Grill inside the historic US GRANT Hotel will host the Dia De Los Muertos Themed Collaborative Baja 5 Course Wine Dinner, a cross-border dining collaboration organized in conjunction with Baja Wine + Food. This special culinary event will pair THE US GRANT Executive Chef Mark Kropczynski with Chef Flor Fanco of Finca La Carrodilla for a one-night-only dinner, themed around the Mexican holiday, Día de los Muertos, or Day of the Dead. The evening will start with a cocktail hour featuring tray passed appetizers, live flamenco music, a Day of the Dead alter and craft mezcal cocktails. Guest will then be served a 5-course menu, featuring an amuse, two dishes from each chef, an intermezzo course, and one collaborative dessert. 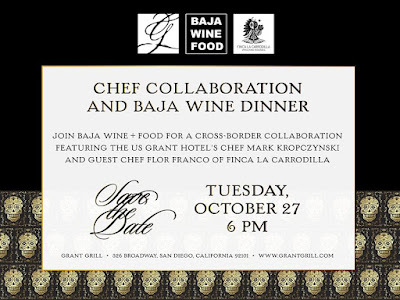 Each course will be expertly paired by Fernando Gaxiola of Baja Wine + Food, who has curated a menu of the best of Baja wines from Adobe Guadalupe, Lomita, Finca La Carrodilla and Vena Cava Vinícola. Dia De Los Muertos is a very special holiday in Mexico honoring those that have passed with a positive and happy celebration. Altars are a very important part of the holiday, built to honor the souls of the dead. "I believe that the beauty of celebrating those who have passed before us through the art of food and beverage is awesome," said Fernando Gaxiola of Baja Wine + Food. "To place upon an altar a favorite food or dessert of a loved one that has passed with the belief that it summons their soul/energy and to remember, honor them in this manner is very moving and in my opinion a very beautiful custom." Tickets to the Day of the Dead Baja Dinner are $125 per person. The full menu is included below Secure your reservations by calling the Grant Grill at (619) 744-2077.